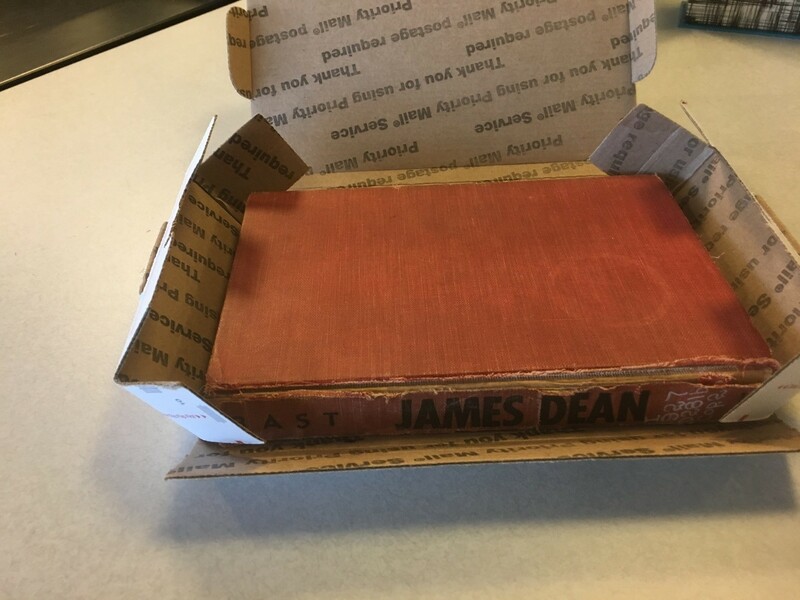 Recently, after a 40-year, 10-month and 27-day absence, a long-missing item was finally returned to the Indiana State Library. Arriving in a United States Postal Service (USPS) box, the package was postmarked from Arlington, Virginia. The book inside was well-worn and much-used. As you can see in the lower right corner it must have also moonlighted as a coaster at some point. With a due date of Aug. 23, 1976, we can only image what an overdue fine would be back then. 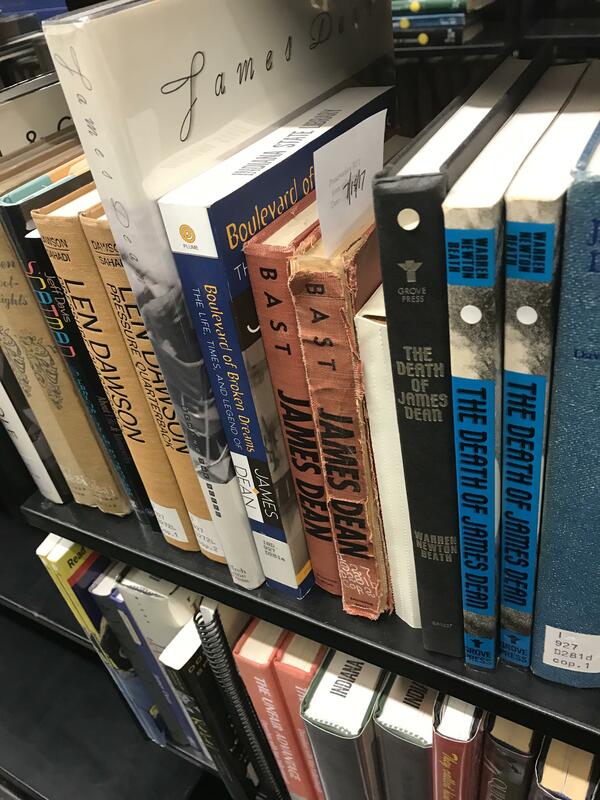 Today, we charge 25 cents a day for overdue books, which would make the fine $3,735.25. The book? 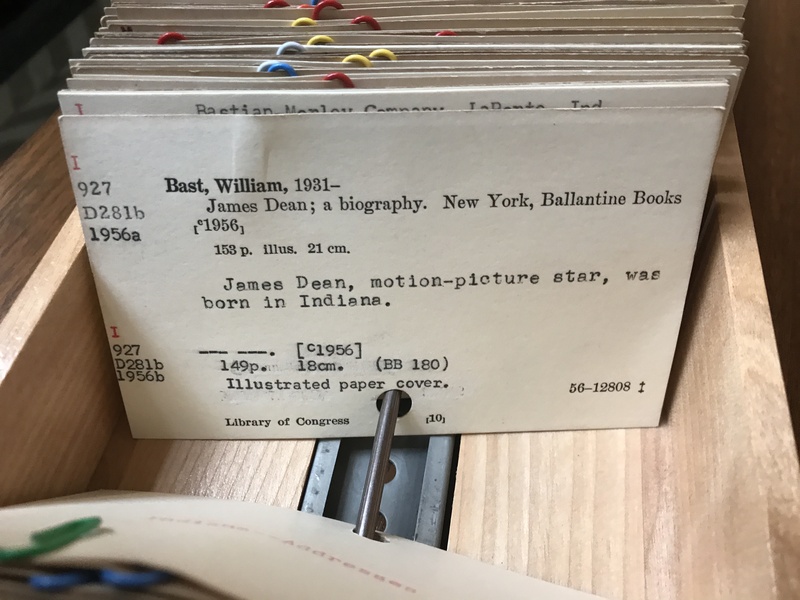 William Bast’s 1956 James Dean biography, which was published a year after the native Indiana actor’s death in a California auto accident. Bast was also Dean’s roommate at UCLA. For now, the book goes back on the shelf with a flag for our conservator to find at a later date for repair work. As for the overdue fine, if there was circulation pardon that I could bestow, this would earn it. However, it had been missing for so long there is no way to trace who had it. Let this serve as a reminder to us all that it is clearly never too late to return an overdue library book. Even though it was due six years before I was born, I’m glad to see it back.